USB Autoscope IV, automotive diagnostic oscilloscope and engine analyzer. Device provides high speed and high resolution. Ignition system testing capabilities are built in to the scope. The hardware and software combination creates a system that provides a continuous (frameless) data capture, which greatly extends the functionality compared to conventional oscilloscopes. Record time is limited only by hard drive space. The USB Oscilloscope is running analyzer script files in order to analyze waveforms. Px_Panel detects anomalies in the shape and position of characteristic points of the waveform. CSS script identifying the cause of misfires. Innovative solution for rapid analysis of the condition of the battery, starter and alternator, troubleshooting them and checking their compatibility with each other using ElPower script. We publish articles related to the latest techniques in TechShop magazine. 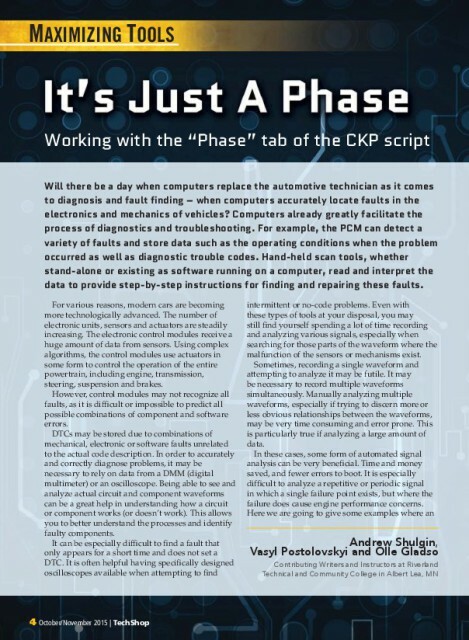 A series of articles was published in 2014 called "Analyzing the Cylinder Pressure Waveform from a Running Engine". Andrew Shulgin the winner of several automotive diagnostic competitions, author of many scripts. The best-known are CSS, Px and ElPower scripts. Our products are used in a variety of automotive applications worldwide. The USB Autoscope displays accurate information on the status and operation of electronic and mechanical systems of vehicles, in a manner that scan tools normally can not provide. 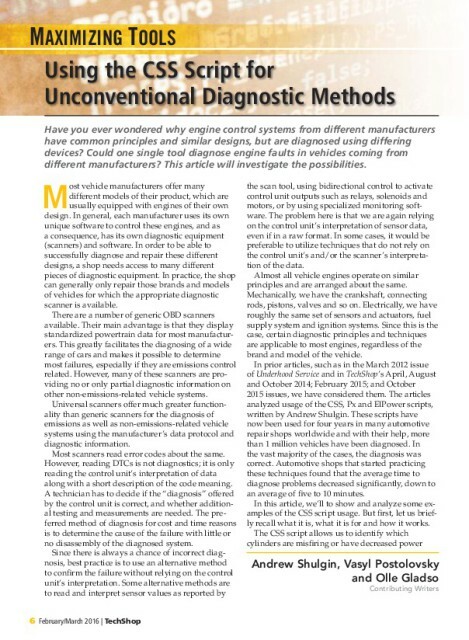 The device allows for rapid diagnosis of engines using the CSS, Px and ElPower scripts. The hardware and software combination creates a system that provides a continuous (frameless) data capture, which greatly extends the functionality compared to conventional oscilloscopes. 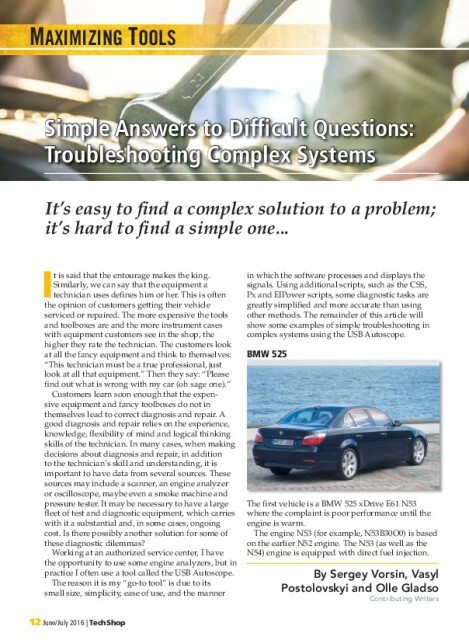 Simple Answers to Difficult Questions: Troubleshooting Complex Systems. Using the CSS Script for Unconventional Diagnostic Methods. It is just a phase. 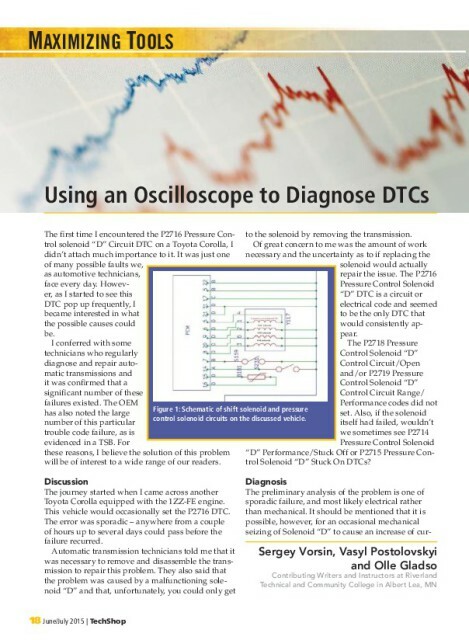 Using an Oscilloscope to Diagnose DTCs. * Reposted with permission of Babcox Media.